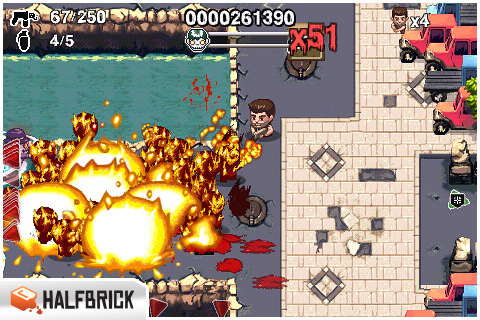 Age of Zombies by Halfbrick Studios is zombie killing app for the iPhone, iPod Touch, and the iPad. You play as Barry Steakfries who travels back in time where zombies have taken over and do whatever you can to wipe them out of existence. Age of Zombies reminds me of old school survival shooter games. Being able to shoot in any direction while trying to survive each wave of enemies that come at you. You will go out of your way to pick up the best weapon to deal with the swarm of zombies before they can hit you three times. This is a game to kill time if you have too much of it. Zombies are the latest in-thing for our time. They seem to show up in just about every form of media. Their popularity has them invading games. 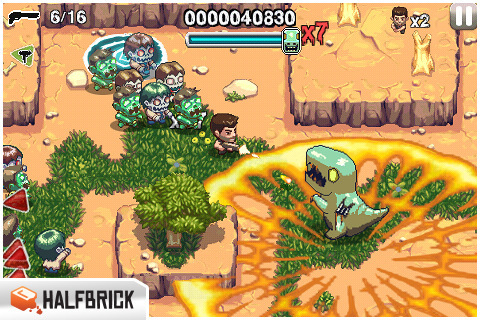 Age of Zombies’ originality isn’t fresh but Halfbrick Studios has pretty good game on their hands. As Barry Steakfries, you will kill all the zombies you want without any regret. Let’s face it they’re zombies and you just want to show them no mercy. You move around the map collecting any weapon you think is useful for the moment and let loose. Be careful of certain zombies such as the puking zombie, gangster zombie who uses a gun, and the exploding ones. You will try to reduce the zombie meter to finish a level by killing all the zombies that spawn from the time portals. On the third stage of a timeline, you will do the same thing but a boss will show up afterwards. The controls are responsive but you have to get adjusted to them. I suggest using the fixed controls for awhile. There is no multiplayer feature but there is a leadersboard. Age of Zombies might not be the most innovative game out there but Halfbrick did a good job with this genre. The graphics reminds me of older generation arcade games. They are polished and are very colorful. You travel to a few places in time where the environments are what you imagine them to be such as the prehistoric age and feudal Japan. When someone takes damage you will see blood. There is no way to turn this off. Age of Zombies’ graphics remind me of something from another era but they are polished enough that I can’t see any flaws in them. The music for Age of Zombies feels nostalgic. I think it is fine but nothing remarkable. The sound effects are what you expect them to be. A zombie would moan or yell out “Brains!”, an explosion, firing shotgun rounds, etc. I like it when you pick up a weapon and its name would be called out like in Metal Slug. The audio is stereotypical. It is what you would think things would sound like. Both the music and the sound effects could be turned on or off. While the audio isn’t remarkable or new, it does fit the atmosphere. The price for Age of Zombies is $2.99. You can download the free version to try out and see if you like it. Also, if you beat the three levels it gives you, you get a four digit code that is unique to your device that will unlock a hoverboard item in the paid version of the game. The hoverboard item is randomly generated and it allows you to move around the map at a higher speed. The app is a pick up and play type of game. Age of Zombies can be a bit cheesy, stereotypical , and repetitive but it has some sort of charm to it that will get you to kill all the zombies you can from beginning to end. There is a survival mode where you kill all the zombies you can to try to get a high score. Try to kill an endless supply of zombies with a weapon other than your basic gun without letting up to increase your combo which allows you to get a higher score. Age of Zombies is not for everyone but if you have an urge for massacring wave after wave of zombies then this is the game for you. Sample the free version of Age of Zombies on your iPhone. AppSafari review of Age of Zombies was written by Tony Lau on March 2nd, 2011 and categorized under Action, App Store, Games, iPad apps, Scrolling Shooter, Universal. Page viewed 4236 times, 1 so far today. Need help on using these apps? Please read the Help Page.